Elvis has a home! 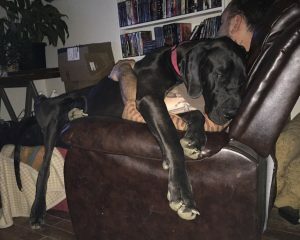 - Rocky Mountain Great Dane Rescue, Inc.
Elvis has a home with his foster family in Thornton, CO. Jen & Matt have had Elvis in their home as a foster for quite some time now. This sweet boy has some behavioral needs that this family has come to learn and have been very successful in accommodating since having him. The many years of Great Dane experience that Jen & Matt have will serve this sweet boy well. He’s landed in his forever home and will never have to worry of another change in his life. We couldn’t be happier for him and his new family. Way to go sweet Elvis.